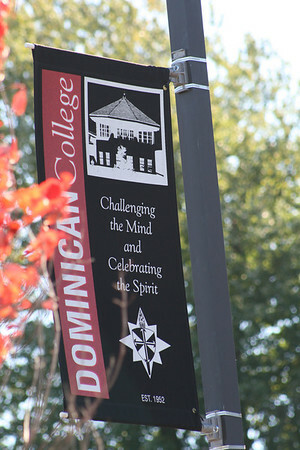 Dominican College is an independent, four-year and master’s-level liberal arts college for men and women, chartered by the Board of Regents of the University of the State of New York and fully accredited by the Middle States Association of Colleges and Secondary Schools. 1952: The College is opened by the Dominican Sisters of Blauvelt as a three-year liberal arts college in the Catholic tradition, offering a teacher preparation program for religious women. 1957: The College is opened to lay students, the first four of whom began classes in September. 1959: The rapid expansion of the College and a desire to contribute to the educational and cultural growth of Rockland County encouraged the Board of Trustees to petition the Regents for authorization to offer a four-year program leading to the Bachelor of Arts and the Bachelor of Science in Education. In that year also, programs in English and History were added to the curriculum. 1966: An absolute charter is granted to the College by the Regents. In the same year Dominican College introduces a program preparing students for New York State certification as teachers of the visually impaired. 1967: French and Spanish are added to the curriculum, and the day session becomes coeducational. 1971: The Business Administration program is inaugurated. 1974: A concentration in social sciences and the baccalaureate degree nursing program are added. The upper-level nursing program provides the opportunity for registered nurses to earn the Bachelor of Science degree in Nursing. 1976: The program in Social Work is added. This leads to a Bachelor of Science degree, preparing students to qualify as general practitioners of social work and also providing the foundation for advancement in graduate work. 1979: The College introduces a program to prepare rehabilitation teachers of the blind and a certificate program for community residence personnel. The 80s, 90s and 00s: The Board of Regents grants authorization for Dominican College to offer the four-year baccalaureate degree program in nursing in addition to its upper-level program. The College’s program in Computer Information Systems is added to the Business Administration curriculum in 1982, and in 1984 the College introduces new degree programs in Occupational Therapy and in Humanities. The College expands in 1987 to include a Bachelor’s degree in Mathematics, followed in 1995 by a Bachelor of Arts program in Biology, in 1997 by a Bachelor of Science program in Athletic Training, and in 1996/98 by dual-certification programs in Teacher Education. In 1980, to enhance its service to a growing population of adult learners, the College had begun offering a number of its programs in a Weekend College format as well as in the regular day and evening sessions. The steadily increasing popularity of these offerings resulted in a series of expansions, including the 1988 addition of a new weekend program in Health Services Administration. It also led to the introduction of three other learning formats for adults: an Accelerated Evening Program (ACCEL) in 1990 and, for nursing students, an Accelerated Bachelor of Science in Nursing option (A.B.S.N.) in 1992 and an accelerated R.N. Program (A.R.N.) in 1996. In 1994 the College’s charter was amended by the Board of Regents to provide for an offering at the graduate level, a Weekend program in special education leading to the master’s degree for Teachers of Students with Multiple Needs. In 1996, a Bachelor of Science/Master of Science in Occupational Therapy was added. These graduate-level offerings were soon followed by an array of other Master’s degree programs: Physical Therapy, in 1988; Nursing (Family Nurse Practitioner), in 1999; and Teachers of the Visually Impaired in 2000. In 2002, the original Multiple Needs program was replaced by a more inclusive M.S.Ed. program for Teachers of Students with Disabilities. In 2004, the College’s charter was further amended to authorize the offering of a Physical Therapy program at the doctoral level. In 2007, graduate programs in Childhood Education and Business Administration were introduced, as was an undergraduate program in Criminal Justice. In 2009, Master’s program in Educational Media/Technology and undergraduate program in Communication Studies were approved. The Bachelor of Science program in Biology was added in 2011 and the M.S.Ed. in Adolescence Education and Adolescence Education/Students with Disabilities program in 2012. In 2014, the College received approval to offer Doctor of Nursing Practice. The College is authorized to offer the following degrees: Doctor of Physical Therapy, Doctor of Nursing Practice, Master of Business Administration, Master of Science, Master of Science in Education, Bachelor of Arts, Bachelor of Science, Bachelor of Science in Education, Bachelor of Science in Nursing, Bachelor of Social Work, and the Associate of Arts.